At the top: our old friend BYU 9024 — the cervical vertebra that’s part of the Supersaurus vivianae holotype. At the bottom, C2 (the longest cervical) of Giraffa camelopardalis angolensis FMNH 34426. 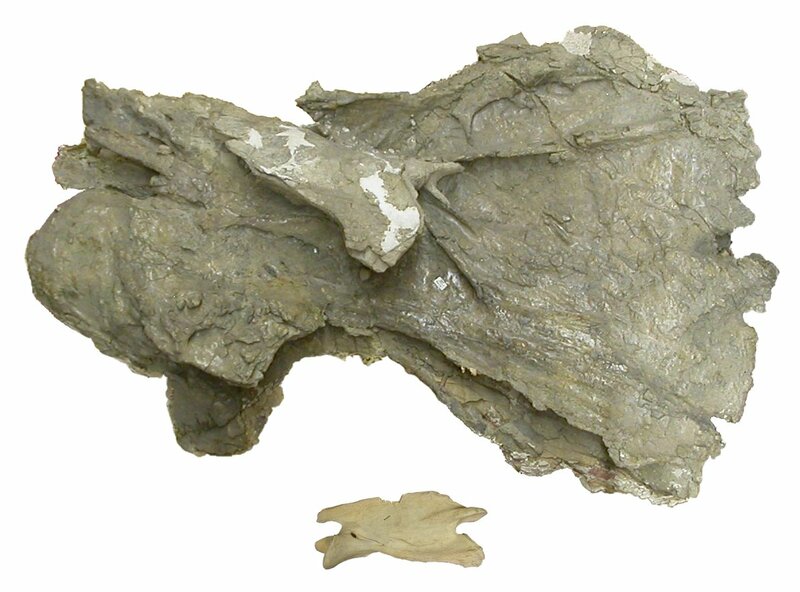 The Supersaurus vertebra is 138 cm long. We don’t know which cervical it is, but there’s no reason to think it’s the longest. The giraffe vertebra is 31 cm long. Not only is the Supersaurus vertebra four times as long as that of the giraffe, it’s one of more than twice as many cervicals as the giraffe has. Did we cheat by using an unusually small giraffe? Not really. When we articulated all seven cervicals as best we could, the sequence measured 171 cm, which is a fairly healthy 71% of the 2.4 m neck of the world-record giraffe. It’s not a monster, but it’s a decent-sized adult. Bottom line, giraffes are just lame. Yes, dinosaur necks are amazing structures. I’m following your work with them with interest. This immensity of these vertebra furthers my suspicions of Supersaurus being a bit more than 32-34 meters long… If it had a 15 meter neck, I find it unlikely that the body and tail only accounted for another 17 meters of length. Could smoething be amiss? When I measure Scott’s skeletal the entire length is ~28.5 meters, but with a neck a mere 9.5 meters long! What is going on! I share your skepticism that the BYU Supersaurus could be as short at 34 m. I think Scott’s reconstruction is probably of the WDC specimen, “Jimbo”. Maybe he’ll comment. Even the WDC specimen is 32 meters isn’t it? I went up there for the Big Horn Basin’s paleontology program, and the plaque said the smaller “Jimbo” specimen was 32-34 meters long. Scott restores the neck as just shy of 1/3 total body length, that implies a length for the BYU Supersaur of roughly 40-42 meters? I just checked Scott’s Supersaurus skeletal recon and found two odd things. First, it seems to only have 14 cervicals, not the default 15 for diplodocids. At least, assuming that the first cervical that I can see with a neural spine, and the second that I can see period, is the axis. Second, using the included scale bar the length of the neck is only 9.5 meters (measured along the curve). That’s too short by far. For the WDC specimen (“Jimbo”), Lovelace et al. (2008: 531) report, “Seven of the cervical vertebrae contain nearly complete centra, each over a meter in length.” In Apatosaurus louisae CM 3018 and Diplodocus carnegii CM 84/94, the seven longest cervicals account for about 60% of the total length of the neck. So even making the conservative assumption that those seven vertebrae are the longest in the series–which may not be true–the neck of Jimbo should be over 12 meters. BYU 9024 has a centrum length of 1378 mm, and a functional length of 1203 mm (Figure 4-3)…. 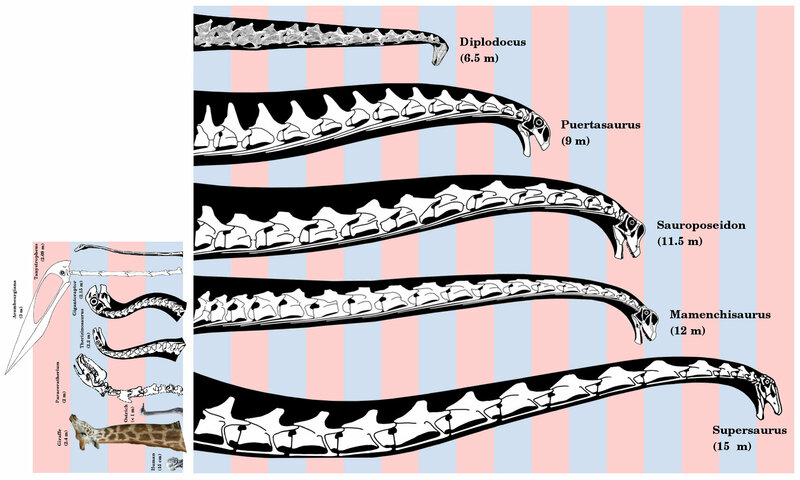 Neck length estimates for Supersaurus vary depending on the taxon chosen for comparison and the serial position assumed for BYU 9024. The vertebra shares many similarities with Barosaurus that are not found in other diplodocines, including a proportionally long centrum, dual posterior centrodiapophyseal laminae, a low neural spine, and ventrolateral flanges that connect to the parapophyses (and thus might be considered posterior centroparapophyseal laminae, similar to those of Sauroposeidon). The neural spine of BYU 9024 is very low and only very slightly bifurcated at its apex. In these characters, it is most similar to C9 of Barosaurus. However, the proportions of the centrum of BYU 9024 are more similar to those of C14 of Barosaurus, which is the longest vertebra of the neck in AMNH 6341. BYU 9024 is 1.6 times as long as C14 of AMNH 6341 and 1.9 times as long as C9. If it was built like that of Barosaurus, the neck of Supersaurus was at least 13.7 meters (44.8 feet) long, and may have been as long as 16.2 meters (53.2 feet). Based on new material from Wyoming, Lovelace et al. 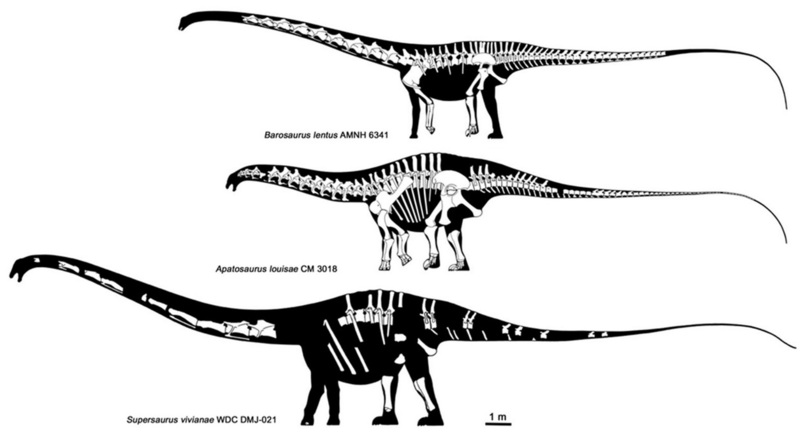 (2005) noted potential synapomorphies shared by Supersaurus and Apatosaurus. BYU 9024 does not closely resemble any of the cervical vertebrae of Apatosaurus. Instead of trying to assign its serial position based on morphology, I conservatively assume that it is the longest vertebra in the series if it is from an Apatosaurus-like neck. At 2.7 times longer than C11 of CM 3018, BYU 9024 implies an Apatosaurus-like neck about 13.3 meters (43.6 feet) long. FWIW, I think that BYU 9024 is a mid-cervical, not a posterior cervical. The low neural spine is legit, as is the very shallow bifurcation at the tip. Those are mid-cervical characters for all known diplodocids. And no matter who you compare to–Apatosaurus, Barosaurus, Diplodocus–if BYU 9024 is a mid-cervical, then the whole neck could not have been any shorter than 15 meters. Which, assuming the neck was 1/3 the length of the animal, which seems reasonable, gives a total length of maybe 45 meters. I prolly shoulda figured this out in time to include it all in my RLN paper. Oh well. Hey guys – which version of the illustration are you looking at? I know it’s in need of some revision, but it shouldn’t be due to the proportions (indeed, we built the physical mount to those proportions using casts of the specimen, so any major problems would have been obvious). On the other hand, I totally could have screwed up the scale bar. I’ll start investigating that as part of a quick rework (darn it, like I don’t have enough things to do right now…) . Following up on the cervical count – the atlas is quite small and probably being missed, as there are 15 cervicals by my count. It’s certainly legit to question the size drop off in the series moving anterior. We actually have a portion of an anterior centra that was discovered too late to make the paper; I used it model the size decrease, so I wasn’t pulling this out of thin air, but it also doesn’t preserve the entire length, so it’s possible that they anteriormost cervicals could have been a bit longer. Come to think of it, it’s about time to come up with a new pose for my sauropods too. I have some ideas, but if any of you sauropod guys want to provide input now would be a good time. Thanks for dropping in to clarify. I used the best version I could find quickly on the web (this one), which looks to me like a dead ringer for the one in the paper, although I might have missed some details. Interesting stuff on the possible anterior cervical. I am inclined to believe you about the proportions, because they don’t look off to me, either, but grab your favorite image manipulation software, check the scale bar, and see what you get for the size of the beast, and especially the neck length. Oh, and thanks for taking this in the spirit of good-natured inquiry! If the neck wouldn’t flex enough to provide an “S” shape and take some torque stress off the posterior cervical, they might have needed to rest it on the next critter in front. We may imagine them thundering across the plains in “V” formation, each head perched on the next’s withers, but what does the leader do? A specimen a much shorter neck, a natural leader for such a caravan, would not be in any way inconsistent with the fossil record. Or they just rotate, like birds do when flying in V formation. FWIW, the “sauropods resting their necks on each other’s backs” solution was illustrated for sleeping sauropods by James Gurney in the first Dinotopia book. Now that we are on the topic of super long necks. Do any of you guys have any faith in the supposed 17 meter neck of the undescribed “Mamenchisaurus Sinocanadorum” specimen? Matt wrote: “If we’re being totally honest, “possibly wrong” is about the best a scientist can aspire to, since the only other alternative is “definitely wrong”. To which I really I have nothing to add, as it’s certainly correct. Ok, reporting back from the trenhes: Working on my high-resolution main file (it’s 8700 pixels across), without any adjustments to the scale bar or the cervicals, I get a length of 11.9 meters for the neck in life (e.g., with portions of the centra obscured due to their opisthocoelous articulation, as aptly described by SVPOW here: https://svpow.com/2013/03/11/tutorial-21-how-to-measure-the-length-of-a-centrum/ ). The articulated nature and the fairly rapid drop off in size of the first four cervicals should adequately explain the 5% difference from the “minimal length” Matt estimated above. I’m not really sure how to explain the discrepancy at this point, but after I’m done I’ll be sure to download the version Matt used and do the same measurement on it see if that one has an incorrect scale bar. And naturally I’ll be posting the revised Supersaurus skeletal once it’s complete. Nope! I have not been able to find anyone who can say how much of that mount is real. Greg Paul usually is very careful about showing how much is real and how much isn’t in his skeletal recons, and he shows the whole thing as being legit in the big comparative giant animals figure in the Princeton Field Guide, BUT when I asked him about it he said that apparently some cervicals and limb elements are legit but the only source of information so far is some kind of publicity publication. It would be super-cool if it was real, but until we get some actual data from a source that isn’t actively engaged in hyping the specimen, I am skeptical. Sweet! We’ll look forward to it. I’ve seen that “Mamenchisaurus sinocanadorum” publicity paper (in Japanese), as it was being touted as the next star of the occasional dinosaur exhibits put up by NHK outside of Tokyo (it would be following the one that starred Jimbo). Looking at it I was under the impression that a heck of a lot of it (like 60-70% or more) was reconstructed, although that doesn’t mean the size estimate is wrong, assuming proper scaling and such from the known elements. Re:Supersaurus – no shame Matt, if I’d been a bit more punctual about updating my website this sort of thing wouldn’t happen. Also, the tail on my past skeletals actually was restored with a bit of motion in the Z (depth) axis, because I first created it in multiple views as a guide for the mount. Fixing that adds a bit more length, and I get almost exactly 32 meters for the length of the upcoming animal (of which ~12 meters is neck). For what it’s worth, I tend to keep a more accurate set of skeletals (though not all my skeletals) at DA here: http://scotthartman.deviantart.com/ That allows me to continue to be lazy at web development, but still throw some of my more recent work up “teh interwebs”. I’ve actually revised almost all of my skeletals in the last year, so if a skeletal has a date older than say 2011, it probably shouldn’t be used without inquiring first. Thank, Scott, that’s all useful info. I agree that the “M. sinocanadorum” mount could be legit, but so far all of the neck length estimates based on properly published stuff point to a neck more in the range of 12 meters, not 17. Not that I think a 17-meter neck is impossible or anything, I just want to see some data. Why do these gigapods get lost (Amphicoelias fragillimus), eroded away (Bruhathkayosaurus), or made public in such a way that it’s impossible to judge their legitimacy (this case)? Kudos to you and Dave for doing a proper job on Supersaurus–now if we could just get everyone else to rise to the same standard.